Environmental activists and heritage conservationists of Sikkim have lost an eminent leader with the death of Chokie Topden. She died in a car accident on April 6, 2009. Chokie was an eco-warrior of the highest order. During my fieldwork and visits in 2007-08, I would often find Chokie sitting with protesting Lepcha activists, giving moral support to those on relay hunger-strike, briefing officials, advising activists on organizing campaigns and managing the media. Some of these youth told me, "Her presence inspires us to protect our sacred land." Lepcha youth activists are opposing Sikkim government's hydel projects in the Teesta Valley and the ecologically rich but fragile mountain ecosystem of Dzongu in North Sikkim. To them she was "Chum Chokie" (Mother Chokie). A storehouse of folklore and religious knowledge, Chokie would often advise activists on how to use culture in strategic campaigning. 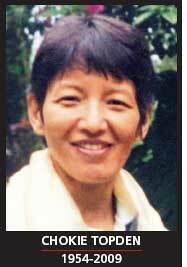 Between 1993 and 1997 she led protests that forced Sikkim's chief minister Pawan Kumar Chamling to shelve the Rathongchu hydropower project. Indigenous people of Sikkim felt the project would desecrate their sacred landscapes, undermine the sanctity of their sacred rivers and violate environmental regulations. Chokie played a key role in organizing media support, in disseminating information and pursuing legal battles--first in the high court and later in the Supreme Court. She partially financed the Rathongchu campaign. I recall her saying she had no regrets in selling her family jewels to safeguard the future of Sikkim. The accident claimed four others: Chokie's elder brother Tashi Topden (Sikkim's former finance secretary, Cherry Topden (Tashi's wife), T W Barfungpa (secretary, animal husbandry, Sikkim government) and their driver. Chokie, Tashi and Barfungpa educated me about the intricacies of Sikkimese society, law and administrative procedures. In one stroke, Sikkim lost not only three eminent members of the erstwhile nobility (the ancestors of Topden and Barfungpa were prime ministers in the erstwhile kingdom of Sikkim), but also people deeply committed to sustainable development.